Now available in DVD. 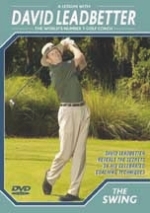 Through careful analysis and use of video recording and playback techniques, David Leadbetter analyzes common errors of an average golfer, then shows precisely how to overcome the errors. Every aspect of the golf swing is covered: grip, posture, alignment, ball position, correct body motion, balance, torque creation, power, hands, muscle, arms, club motion. It is through his unique style of instruction and some rather unusual teaching aids that Leadbetter demonstrates how he is able to quickly improve his pupils’ performance. In addition, Leadbetter also reveals a number of very useful exercises all his pupils can use to practice the development of a vastly improved swing.